What do you think about the approach of always writing using WRITE_THROUGH? That way you can control durability at the individual IO level. When you tell the OS to write a buffer to disk is the write atomic? Ordered? The operating system also requests a write-through of the hard disk's local hardware cache to persistent media. This is mentioned only when both are valid. There is also a mention of performance benefit when using both because we skip metadata updates. There is also another issue, we don't actually want to read from the journal (unless we crashed, which is different), so there is no real point in filling the system cache with stuff that should never be read. Disk writes are atomic to a single sector (in other words, a 512 bytes write should be atomic), but in practice, you don't rely on that. You force flushes (either via the flags or via fsync) to make sure that there is proper ordering between those operations. Note that the file system is free to reorder and break apart I/O requests as it wishes, and only fsync / flags can cause it to do this directly in a way that an application can take advantage of it. Right, but what do you think about doing that (using both) as an IO strategy? 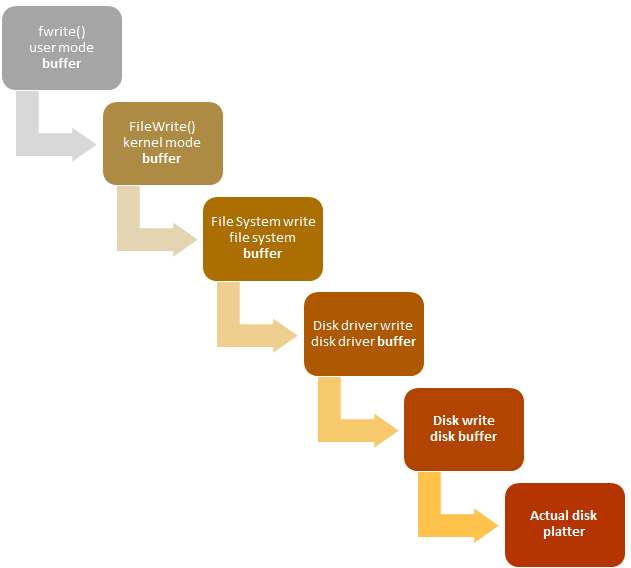 So when disk writes your buffer that spans a bunch of sectors it does so in the order - one sector after another? Can it happen that it writes atomically the last sector first and then loses power in its capacitors? OmariO, There is absolutely no guarantee with regards to what order the disk is handling the write. In particular, while you can probably safely assume that a write that cover an entire sector is sort of atomic, that isn't always the case (consider remote file systems), and you can't assume that the writes will go in any particular direction. When you have multi sector write, for example, the drive is actually encouraged to write it in a different order then the one you specified (maybe the disk head is in the proper position to start from a particular location, so it will start writing there), so you can have a write to sectors 1,2,3 and 5, but not 4 (in the same multi sector write). That would be strange, but depending on the actual layout of the data on disk, that is possible. Fragmentation plays into that a lot, too. So even though you think you issues a three sector writes that are right next to each other, they may have been allocated very far away, so they can be written in any order. Basically, the short answer is that until you get a fsync() result back, you can't really assume anything about the data on disk. And you need to be suspicious of fsync under certain systems (sometimes admin / kernel / driver just turn it off for whatever reason). Thanks for the detailed answer. Looking forward for the next post! Argh! This is worse than Game of Thrones. You set up a fascinating discussing, and then say "more on this in the next post". I want details! Ross, There are currently 15 posts in this series, talking about everything in detail. Trying to get it all in one post means that people skip a lot of the details. Craig, Yeah, this is what happens when you can't trust the disk. It is a bit high than the numbers I'm familiar with, but he is talking about decades old low end hardware. Note that at this point, the entity responsible for figuring out is the file system, not the database itself, there are some things that a database can do to recover from them, but they are quite expensive, and a good file system should already be doing them. And you are supposed to run your db on something a bit better than a single low end hard disk. I have two questions related to the use of fsync: 1. How much performance does it cost to wait for the writes to complete (i.e. moving from the "Try" to the "Crash" or "Power loss" level)? 2. How do you deal with admins disabling fsync or hard drives ignoring fsync? Daniel, With fsync & friends, we are seeing on one machine steady state of 65MB/sec writes to disk, with peeks of about 550MB/sec. Without it, we are seeing steady state of about 20MB /sec with peeks of about 550MB/sec (but usually the peeks are around 330MB/sec). To compare, writing 2 million 2KB items with fsync costs gives us a rate of about 7.4 items per ms. Without fsync, we are talking about 7.8 items per ms.
Now, to be fair, this is just by removing the fsync all, the rest of the code still make sure that the preparation for actually writing with fsync. If we didn't have it at all, we would see a major difference in the architecture of the solution. Because we would be able to rely on different guarantees from the OS. In other words, while I have some numbers here, they are very suspect. Another project of ours, writing a log file, can do roughly 400 MB / second sustained without putting too much pressure on the disk, by explicitly utilizing the buffered nature of such calls. In general, I would say that the cost of fsync and friends is an order of magnitude. If you are calling fsync directly, this is really expensive. If you are doing it in the optimized fashion we do, it is still expensive, but much less so. As for admins that turn this off. They sometimes have valid reason (battery backup exists), and there is no way the database itself can discover whatever this is the case or not. Both that and lying drives are stuff that you just have to live with, document carefully and trust the administrator to make the right decisions.